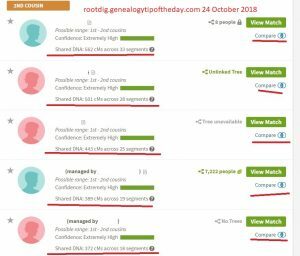 Crista Cowan of Ancestry.com answered a question about “hints” on Ancestry.com for my “Genealogy Tip of the Day” page recently and I thought it would be good to include her answer here (indented) with some comments from me. Remember: the hints and suggested records are not comprehensive and not perfect. Sometimes I use them when I’m working on a brand new person and sometimes I don’t. Ancestry.com only uses the name field (and includes the spouse’s surname for women) when searching for hints. It does not look currently look at alternate names or nicknames. However, keep in mind that primary hints are only provided for the top 10% of Ancestry’s most popular record collections. Hints come from information in your your tree which is used to generate the hints. The searches are automated. As pointed out, the hints only grab the “low-hanging” genealogical fruit and researchers should confirm that the “hint” is actually the person of interest. 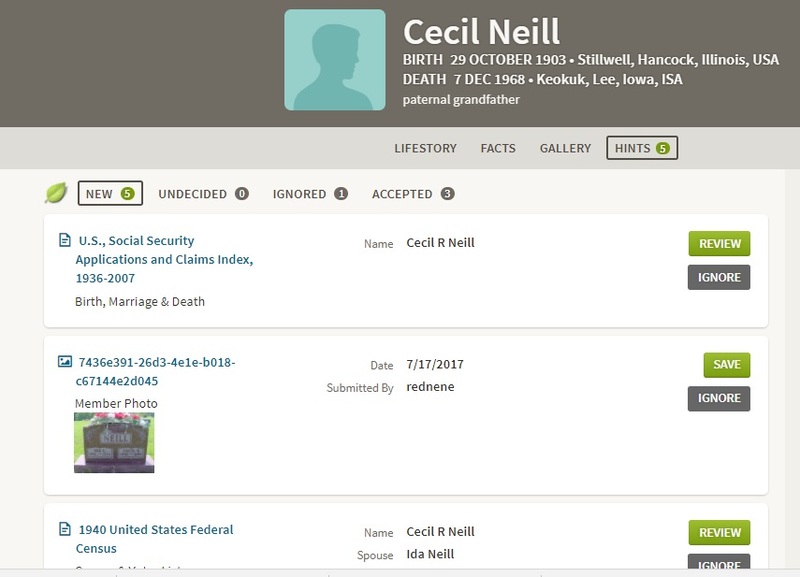 Hints do not find every possible reference to the person of interest in Ancestry.com‘s databases. It’s up to the individual researcher to perform broader searches or search specific databases if there’s reason to believe your person of interest will be in those records. The hints, which are imperfect, are intended to get you started. They are not perfect and they are not meant to be comprehensive. Secondary hints (which are the same thing as Suggested Records) are provided when another Ancestry user has attached the record you are viewing (or have also attached) to their tree. These suggested records are the other records attached to that same person in someone else’s tree. Neither hints nor suggested records are designed to catch every single record about a person across all 22 billion historical records on Ancestry. They are designed as a way to get people started making discoveries. Suggested records should also be used with care. Just because someone else has connected the two individuals together as being the same person does not mean that they necessarily are. You may find suggested records that are in databases the “hints” do not catch–as long as someone else has tied that record to the person. Difficult to find people often don’t have many suggested records, if any at all. However, I’ve seen suggested records that were for the “right person.” Like the hints, they often are low-hanging genealogical fruit–unless a real eager genealogical beaver has researched the same person you have. Of course, suggested records and hints can overlap. But confirm that they are the same person–don’t just connect them to your individual because someone else has. From there, knowing what you know about your ancestor’s names, nicknames, and variant spellings, you can do targeted searches in specific record collections to find the records you need to answer your research questions. Exactly. The hints and recommendations are meant to get you started. Chances are if you’ve researched the person for a long time you’ve already located the references anyway. Once in a while they will locate something new. But the hints and recommendations are from automated searches and connections others have made. You should automatically force yourself to check that connection. I totally agree, I use the maybe button if not sure. Boy, that’s my exact thoughts exactly. I have so much fun playing detective on my family. I so appreciate the help u give & advice. I know u r not expected to do the people’s complete work 4 them. But I ‘m so impressed by what u all can do.Thank uou all 4 all the hard work everyone does to help us out. May u have a wonderful weekend.